The Largest Living Turtle Species Is The? Which Of These Weather Phenomena Are Known As "St. Elmo's Fire"? You might expect us to open by talking about how huge a leatherback sea turtle is compared to other turtles. But the leatherback sea turtle is so big compared to other turtles that we actually need to move up the family tree to get to any real, meaningful comparison. The leatherback sea turtle isn’t just the biggest turtle, but the fourth heaviest modern reptile in the animal kingdom, outclassed in the heavyweight ring by only three members of the Crocodilia family. That’s right, the nearest weight-class reptiles to a leatherback sea turtle are the largest of the crocodilians: the salt water crocodile, the Nile crocodile, and the Orinoco crocodile (alligators, if you’re curious, don’t even come close to eclipsing the leatherback sea turtle). So how big is big in the turtle world? A mature leatherback sea turtle can be nearly six feet long (when measured in curved carapace length) and, if measured for total length, can exceed seven feet. When they’re young, they already weigh hundreds of pounds, but by maturity, the largest leatherback sea turtles can tip the scales at a little over 1,500 pounds. In addition to its hulking size, the leatherback sea turtle is notable for its name-giving carapace—unlike other turtles that have shells made of interlocking plates, the leatherback sea turtle has a leathery skin-like shell that gives it an appearance more like that of thick whale hide than an interlocking mosaic of bony pieces. Additionally, the ridged teardrop shape of the leatherback sea turtle’s body gives it the most hydrodynamic body of all the sea turtles. 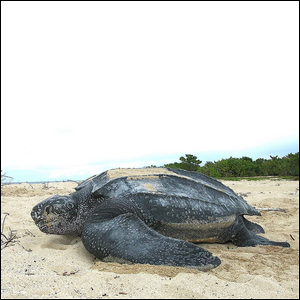 Between its streamlined shell and enormous flippers (large adults can have a flipper-span of nearly nine feet wide), the leatherback sea turtle can easily power its way through the ocean in search of food, mates, and nesting sites.